PSA says that one of its Citroen C4 prototypes had successfully passed through a tollbooth without any driver input. PARIS -- An unlikely battleground has emerged in the race to develop autonomous vehicles: tollbooths. Renault on Monday announced a collaboration with Sanef, a French highway operator, that is focusing on how self-driving cars navigate toll lanes. 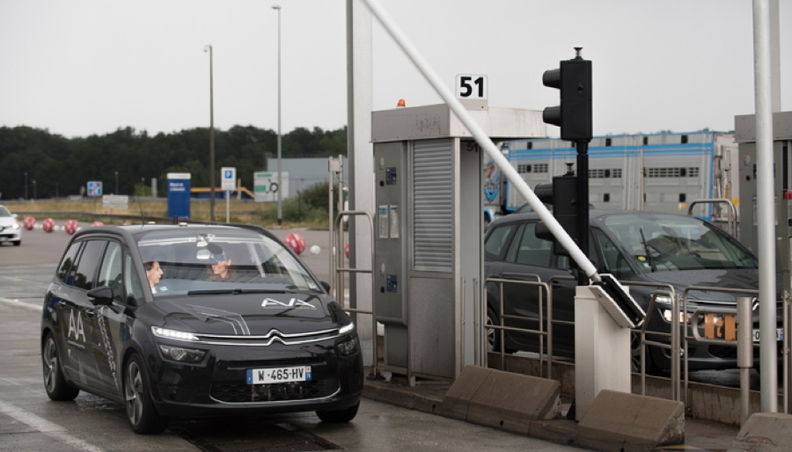 Two days later, Renault’s French rival, PSA Group, said that it, too, was partnering with a road infrastructure company -- in this case Vinci -- and that one of its Citroen C4 prototypes had successfully passed through a tollbooth without any driver input. Toll exchanges offer particular challenges for autonomous vehicles. Lanes have no dividing lines for onboard cameras to capture; the booths are just three meters wide; and other drivers often make unexpected moves. A self-driving car that can adjust to those conditions can probably handle other areas of potential danger, such as traffic circles and work zones, engineers say. The tollbooth rivalry between Renault and PSA illustrates how competitive the race to develop and market autonomous vehicles has become. A new study from the consulting firm AlixPartners argues that only a handful of winners will emerge from the 50 major companies now spending billions on the technology. With future leadership in the automotive business at stake, vehicle manufactures are entering into more and more collaborations with non-traditional partners. According to John Hoffecker, global vice chairman of AlixPartners, there were 195 collaborations last year alone, with more than 200 companies coming from outside the auto industry. PSA and Vinci set themselves an ambitious target for the test, the toll station at Saint-Arnault on the A10 highway southwest of Paris, which is so large that it even has its own Wikipedia entry. With 39 lanes, it is the largest exchange in Europe, according to Vinci and PSA. The process starts about 500 meters before the exchange, when a guidance system starts to direct the car toward specially equipped toll booths. A roadside transmitter 300 meters before the exchange sends information to the car about which lanes are open. Guidance continues until the car re-enters the highway, where its cameras can “read” the painted lines. Renault’s system is similar, although the company says that guidance starts about 1 kilometer from the toll booth. Both French automakers are also affiliated with Scoop, a French consortium that is working with similar groups around Europe to develop a common protocol that allows communication between autonomous vehicles and the roadways. The companies are also working together on guiding autonomous vehicles through parking areas and seeking the best ways to transmit real-time traffic conditions. PSA said the successful test was “an important step toward Level 4 autonomous driving on motorways.” As defined by SAE, Level 4 means that the driver will not be asked to take control of the car if something goes wrong. That degree of autonomy will not appear before 2022, manufacturers say, as few European countries, with the exception of Germany, currently allow Level 3, in which the driver can be asked to take over at any time. Audi this week said it would offer Level 3 autonomy on its forthcoming A8 flagship sedan, which when rules allow will be able to navigate by itself at low speeds. Last month, Germany passed a law that allows drivers to cede full or partial control should their cars have Level 3 or Level 4 autonomous driving capabilities.